Sure, this isn’t the first time that we have reported on MP3 players from SanDisk, such as the Fuze and the slotMusic Player. I thought I’d give my two cents and report on a new development from the SanDisk music company with the Sansa Clip. 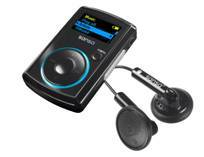 The Sansa Clip is an MP3 player that is small with a ton of features thrown in. That might not seem new in today’s MP3 market, but what is new is that this tiny device packs about 8GB worth of memory. In case you don’t know, 8GB is enough for about 2,000 songs. Other features include the podcast and audiobook support with automatic bookmarking, an FM tuner, as well as Rhapsody DNA integration with playback of MP3, WMA, OGG, FLAC, and Audible files. Hopefully, it will have the features of its other, lower memory models, including a long-lasting rechargeable battery and a bright screen for easy tune navigation. Isn’t it amazing the advancements that MP3 technology has wrought in just the recent years? Soon there will be all kinds of memory available in something the size of a Creative Zen Stone. Well, the SanDisk Sansa is about the size of a matchbook, and 8GB isn’t bad. It should be available soon for about $99.